If you’ve ever thought that there’s just not enough GlaDOS in your life, then you’re thinking on the same lines as Valve. We’ve had her/it appear as a guest in Poker Night 2 and LEGO Dimensions and Defense Grid, though never doing what she does best – leading you through a series of test chambers whilst making you feel worthless and irrelevant. Now she’s back in Bridge Constructor Portal overseeing your competence as a test operator and your ability to build pathways from one point to another to avoid convoluted traps. Can the premise of bridge construction in an Aperture Science led world really work? Too right it can. 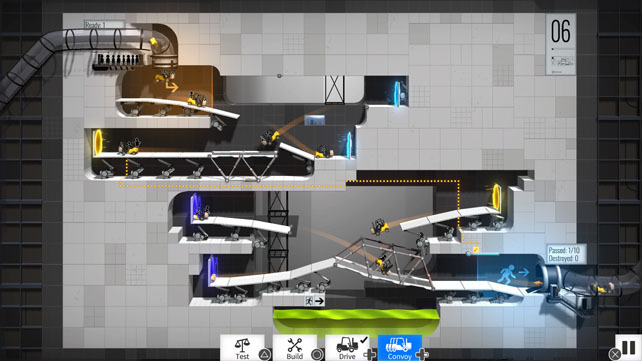 What you’ve got here is a pure puzzle game that wants you to build bridges that link sections together and allow your little forklifts to get from the entrance of the level to the exit in the most efficient way possible… i.e., by not killing off all your drivers. With two building elements at your disposal and anchor points sporadically located around the test chambers, it’s up to you to become the designer and build the pathway. Of course, it doesn’t remain that simple. 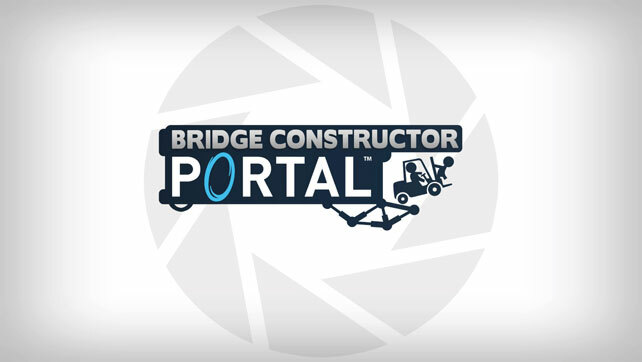 Bridge Constructor Portal starts off by teaching you the basics of civil engineering and how to make do with struts and cables to create roads, then it adds the titular quantum tunnels into the mix to make the most effective use of the 2D space. With this being Aperture Laboratories it doesn’t take much longer to throw in aerial faith plans, repulsion gel, turrets, companion cubes and almost everything else you’d expect to see. Here begins the real education and 60 levels of mind bending goodness. 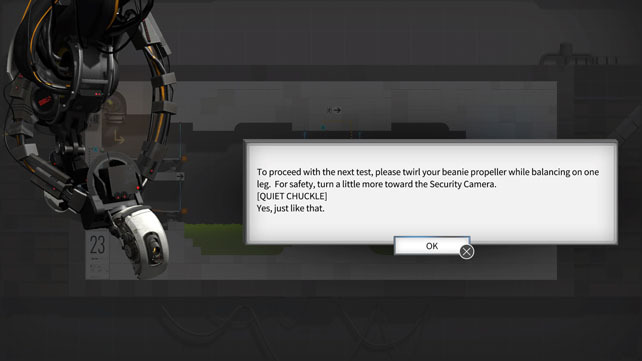 What Bridge Constructor Portal manages to replicate is the initial rush of mass confusion as you try to comprehend exactly what it is you’re looking at, then either the slow dawning of how it’s possible to complete, or the trial and error approach that eventually brings about the solution. These are fiendish, make no mistake, but you always have the tools at your disposal and the knowledge to get to the end. As with all good setups there are clues in the names of the levels and a reference guide always on hand that gives you a summary of the construction principles. However there isn’t necessarily only one way to complete each level, and even though anchor points are in fixed positions with limited reach that makes you think of only one outcome, there’s a surprising amount of freedom on hand. There are 60 levels to get through, with things broken up into 6 different sections. The goal is first to get a single driver across, and if that’s successful then it’s time to send a convoy. 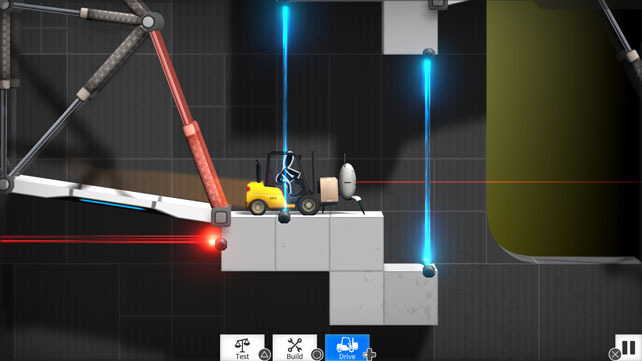 This adds a second level of challenge to the game as getting a single forklift to the exit can mean being a bit reckless with the design and not worrying if sections fail. Having to deal with multiple vehicles means creating more stable structures, and more often than not, revisiting and tweaking your initial design. It’s quick to clear and rebuild if it’s gone wrong, and you can save a few designs you’re happy with so that returning to them later doesn’t mean the chore of fully recreating everything. Depending on how well you visualise your preferred option will determine how long you spend figuring things out so just make sure you’ve got nothing pressing coming up. Portal was all about physics puzzles and this is no different. The struts deform and break if they’re overloaded, cables snap if they’re too strained, and floorways will collapse if they’re not clearly supported. The key is triangles and getting as much support in place as possible, though it’s easier said than done in some levels. You’ll end up amazing yourself with some of the contraptions you come up with. Once you’ve mastered all the levels there’s no official challenge to go back to, but if you fancy setting yourself more to do you can try and solve the levels whilst spending as little money as possible. Can you make the lightest weight bridges possible for almost no cash? It might seem like a strange collaboration, and even odder when a lot of people really want a third instalment of the Valve developed series, but it makes a lot of sense as soon as you’re playing. 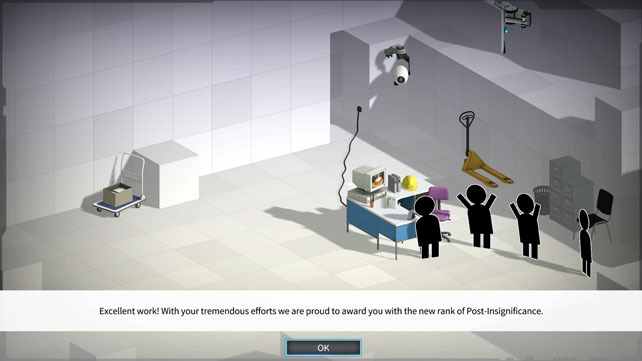 Once GlaDOS starts introducing you to the testing programme and when the isometric intro videos that are so reminiscent of the original Portal advertising campaign start, it all clicks into place and you realise that this was a no-brainer to put together. Bridge Constructor has always been a good puzzle game that appeals to the engineer in me, and now it ticks all the boxes by adding the sci-fi and one of gaming’s greatest tropes. 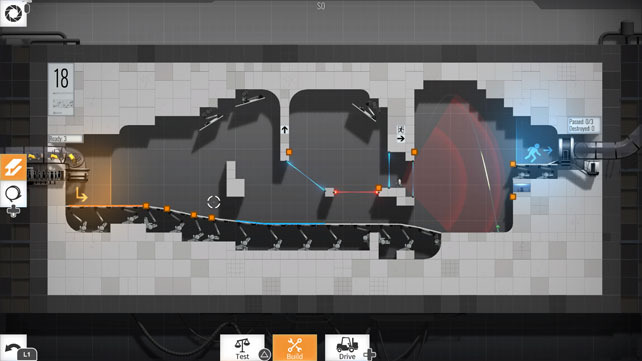 A simple enough premise with deceptively tricky scenarios that’s put together with exactly the right level of detail, Bridge Constructor Portal should be on the list for everyone to buy. 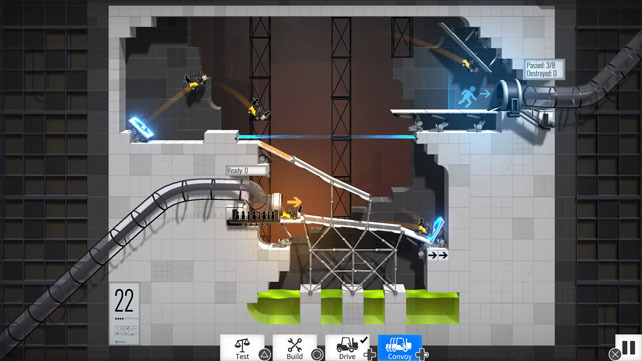 A PS4 review copy of Bridge Constructor Portal was provided by the Headup Games PR team, and the game is available now on iOS, Android, Xbox One PC, Switch and PS4.